Specifically what will happen to Dubai’s property prices the coming month, quarter and year? A question we come across so frequently those days. We read daily reports with projections ranging from the market softening to the market dropping. We see formulas and ratios linking the market sometimes to some of the fundamentals and others to some technical indicators, or market moving elements from the price of commodities to the mess taking place in some part of the middle east. We lived the same market dynamic several times in the past and we will live the same media dilemma several times in the future. Regularly we try through our news section to shed light on the property related news to give our investors and followers the ability to grasp an idea about the property market and market movers. Our web editing team couldn’t find one piece of news in the past few days that could be classified as reasonable. All news published and shared is either giving negative projections and relating it to hundreds of reasons to prove it, or claiming against such projections and using the same or other hundreds of facts to prove the same.Here I share my over view which I hope would be as objective as possible and as realistic as possible. I will review with you some of what I published in the last 16 months when all the market was bullish and give my opinion about what’s coming. However what I will not be able to do is answer the question above; and here is why. I published on the 11th of January 2014 the following.“Exactly the time. Looking at a city with endless possibilities, asked another time, which is the best property to purchase? Another time I ask. What is the purpose of the purchase? Same answer faces me. A fast flip. On 17th of January 2014 I published.Be cautious! Over investing is a very wide spread phenomena especially in upbeat times. Over investing in any market and any asset class will lead you to a long term guaranteed disaster. And this is one of the rare things you can guarantee while investing. Investors In stock markets start over leveraging and go for junk stocks mostly where prices are less stable, and fluctuation parameters are bigger as they are moved by vibe rather value and fundamentals. In Property investors will drift away from income generating properties and tend to reach out for under construction property where price volatility is more probable or over leveraging as the banks aren’t any wiser and start throwing funds encouraging investors to over invest or shall I say -gamblers to over gamble-. Past times proved that no one knows a peak otherwise past crashes wouldn’t have been that detrimental. No one knows the peak nor the bottom. Value investing will keep you on the right track, while adrenaline enthusiasts can -play around- with a small portion of their portfolios (not to exceed 15%) by investing into more volatile, none income generating assets to increase the possibility of having high rates of return, while not risking going under if times changed. Calculated risks gives you the ability to decide which risks can you afford or not. On 23rd of February 2014 I published.Again a run towards off plan property..Not bad except that some of us or most of us are doing it for the wrong reasons.Although purchasing property off plan has several advantages, fundamentals should still be considered while such a step is taken. Property unlike futures, stocks, derivatives, bonds and gold of other commodities, is bought to be lived in not traded. 6. Projected running costs post completion.Last but not least, HOW ARE YOU GOING TO PAY FOR IT. If you’re buying property off plan to spread your cash to the max even beyond what any financial institution would lend you then you are planning for your big crash, or at best gambling and going all in even without looking at your cards.Be cautious. invest healthy, homes are meant to help us get happiness and stability not grieve and sorrow. And again on the 5th of August 2014 I published.A sigh… preparing for the coming growth trend.A question which seems to be disturbing most home buyers/owners/sellers those days, where is the market going; have the market grown beyond it’s real potential.Let’s look at few points to evaluate the situation.How does the price of land compare to price of land in similar metropolitan cities internationally.What is the price of property relative to cost.How big is real estate as a portion of GDP.What are the other sectors of GDP and how are they doing. (evaluating fundamentals)Future prospects.After evaluating all those points let’s ask ourselves the most important question why are you buying or own a property. The right reason is as important as the right timing. Here we are today 13/12/2014 looking at a softening market, thinking among ourselves have the market lost pace- Have the market boomed and is ready for a crash- Have the market grown beyond it’s real potential. We also use reports and predictions to confuse ourselves further. Some talking about the benefits of EXPO2020, others talk about the oil price drop, few of us ever get regional security and the international political game into the discussion. Some talk purely about technical indicators and fundamentals. And finally the few who go deeper into the crowd’s emotional intelligence and talk about sentiment and the drive towards important episodes. We see parameters or when will the market change up and down, we sometimes even hear specifics about the 63.5 days or the 4 months and a quarter it may take for the market to change direction again. Gents all those reports and arguments are so interesting to read and analyze. However let’s go back to basics. I said it in great times, I said it in bad times, and I will say it in all times, it is the same. I will not say something new. Please answer those questions for me and you will get the answer you are aiming for. 1.Why are you purchasing property?Is it to be an overnight millionaire. If so, I hope you make much money, please stop reading what I publish and continue reading the reports, any of the reports. Actually you can even stop reading the reports and flip a coin. Head towards volatile markets, hit and hope that you can run..Is your purchase to create consistent stream of incomes and make some money over a descent period of time; or to live in it and hopefully make some money over the long run on top of the rent save. You are on the right track. The question paused above won’t matter to you. We all know that no one could predict the peak (except by mistake) or the bottom (also by mistake) thus the additional few pips you will save waiting for a market to soften further or lose if the market went up in the overall scheme of things is meaningless. Let’s spread the 8% you would save if you were so lucky and while waiting the market dropped by that much, over 10 years- or even seven years. See how meaningless it is.If you are buying the right property today at a descent price, researching properly, negotiating properly, and sleeping over it to take the right choice you will score right every time or let me say most of the times to stay within the parameters of gravity. 2.How are you paying for it. are you over investing- regardless of your aim of the purchase, it is advisable to always by with the ability to hold long term even if your aim is to profit short term. For some property is only a shelter, and a source of pride.For others property is only an asset, and a source of profit.It doesn’t matter how you view property it always provides you with the following:Hedge against inflation, currency risks.Income producing, while the probability of growing in value. 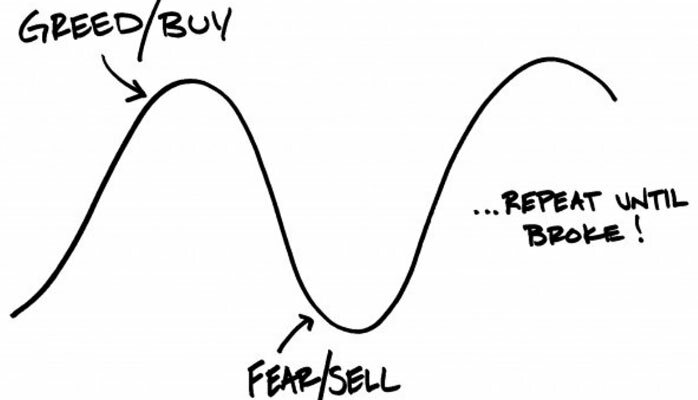 Enjoy your investment and make sure you don’t follow the advice of whoever is guiding you by the attached graph.